As shattering as a falling porcelain vase, its pieces ricocheting across the floor. Alison Bechdel’s drawing style is photographic, and it replicates every precise detail of her lavish, but stifling family home: a home that’s a labour of love by her late, antiques-loving father. She acknowledges her own meticulous working methods within the book’s framing device, where she depicts herself, a 40-something cartoonist sweating at her desk, drawing on multiple reference images for each frame. And her meticulous approach is echoed in this astonishingly, differently beautiful musical. It’s reflected in one of Alison’s very first lines, where she confesses clinging on to her departed father’s cherished antiques – “I need real things to draw from, because I don’t trust memory”. (This is something that I find hugely comforting, so far from the stereotype of the virtuoso cartoonist who rattles off page after page from pure teeming imagination). Bechdel has attributed her careful working methods to her OCD. A section of Fun Home, the graphic novel, explains that the childhood diary entries her memoir draws on were partially obliterated by obscure symbols, scrawled on to protect the people she wrote about from catastrophe, or to express her uncertainty about the truth of her version of each day’s events. She’s as careful in representing her family members as an adult as she was as a child: the sequel to Fun Home is Are You My Mother? – a sketch of the mother who was frustrated at how thinly she emerges from the pages of Fun Home, a book that’s soaked in the pain of an unfulfilled father-daughter relationship. Fun Home, the graphic novel, mixes sensitivity to the real family secret she’s writing about with the densely worked and covered over qualities of the childhood diaries and college notes it draws on. It’s intensely literary and metatextual, unfolding and critiquing an omnivorous, subversive queer reading list within its pages: Colette, Joyce. And this complexity feels inextricable from the ideas of repression it’s soaked in: from her father’s queerness, hidden and dangerous in a small town, and the echoes it finds in the story of flamboyant, controlling Gatsby and his secrets, of Dr Spock and his theories of childhood suppressed anger. 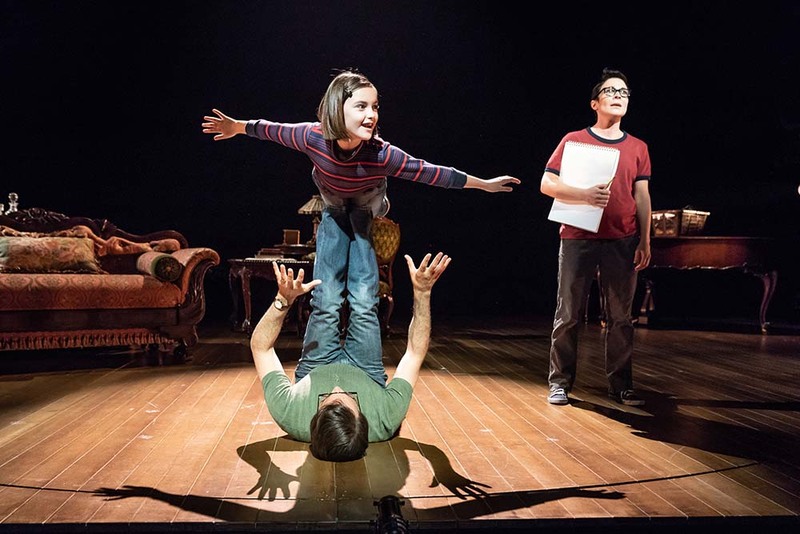 If I had to sum up what makes Fun Home, the musical, feel different, I’d say that it feels… untethered. It doesn’t reference Bechdel’s OCD, or her intense queer literary odyssey – a decision that gave me a bit of a pang, both because it’s rare to see mental health conditions or omnivorous reading habits represented authentically on stage, and because you do feel a bit of a pang when an artwork you love in one form takes on another. It’s a metamorphosis that changes both the thing itself and the place it has in your memories, laying over the book’s original words with a new rich texture of faces and sounds and melodies. But where this process is often rueful, here it’s shot through with joy: the left-out parts of Fun Home are left out in the service of creating a show that feels less like a solo by Alison, and more like an equal duet with her father, who’s played with astonishing, cracked intensity by Zubin Varla, real rather than 2D. It’s like the emotional heart of the book has been somehow distilled and allowed to sing out, literally. There are very few well-known female musical theatre composers and Jeanine Tesori inhabits her earned fame by making work that feels markedly different to other Broadway shows. Her music mixes a Bechdel-appropriate density and complexity – in Fun Home, melodies swirl and layer over each other, as in her still more intricate Caroline, Or Change – with a kind of yearning, warm emotionalism. The palate of sounds could have been plucked straight from Bechdel’s 1960s and 1970s childhood, mixing her parents’ refined classical music (her Dad’s insistence that she wear a dress, not tomboyish jeans, is echoed in pedantic broken chords in ‘Party Dress’) with the kids’ funky Jackson Five-style numbers like ‘Come to the Fun Home’. Its most heartfelt moments are reserved for the Alisons (there are three: child, young adult, and narrator). ‘Ring of Keys’ is the song that melts everyone, because it’s both beautiful and an incredibly singular thing: a song of yearning sung by a tiny girl who’s transfixed by a butch delivery woman who opened up possibilities she never saw before. It’s so powerful to have this hymn to the butch aesthetic in a musical theatre show, sung by a kid who makes its truth feel self-evident, in a way it so rarely is in a genre where women so often (still!) have to be either slinky and crystal-studded or staid and aproned, matronly. But for me, the show’s emotional heart came from ‘Flying Away’, where young, demanding child Alison duets with her two more mature selves, innocence contrasted with painfully acquired knowledge. Jeanette Winterson has written that she views her narratives as a spiral: “As a shape, the spiral is fluid and allows infinite movement. … I really don’t see the point of reading in straight lines. We don’t think like that and we don’t live like that.” A ‘queer’ structure is something used by Bechdel, too. Somehow that structural vision’s made real extra-vividly when the form of a first-person narration gets broken apart into a musical that’s sung from colliding, conflicting viewpoints that are split across decades: ‘Telephone Wire’ mixes Alison’s desperate present need for communication with her father’s unsatisfyingly distant reminisces about a boy he loved, once, at school. It’s a form that’s true to the way memory works, with each step through your childhood home letting snapshots and resonances flood in, their path uninterested in precise chronology and narrative. Fun Home’s structure is simultaneously endlessly complex and very, very simple: it’s about family, and buried pain, and the tension between conformity and liberation. The liberation gets a little less of a look-in, here: the scenes of sexual awakening are thoroughly PG, with an under-the-blanket reticence the novel never showed (would a queer female director have made more of them?). Still, Sam Gold’s production comes into its own when Joan, Alison’s almost threateningly liberated first girlfriend, sees her home with outside eyes. And as she crosses its threshold, his solitary bravura directorial flourish suddenly makes this densely decorated gothic house visible in all its detailed, complex, majesty. Just as Joan transfigures Alison’s home with her gaze, Fun Home, the musical, makes you see the Young Vic audience around you in a new way. ‘Telephone Wire’ is a song that documents the moment where Alison and her Dad try to go to a gay bar: she’s IDed, so they both traipse sadly back into the car, an opportunity lost. But if their moment of connection is faltering, the show allows a more successful kind of bringing together. At that moment I felt so aware of being in a Young Vic audience full of people from every bit of the LGBTQ+ umbrella, visibly or invisibly queer, in blue hair or in suits or in tears. People who came of age in times or cultures of repression, and people who came of age in times of relative openness. All there together, in the same space, soaring. Fun Home is on at Young Vic Theatre until 1st September – more info here. It’s currently returns only but we are crossing all our fingers for a West End transfer.